All pianos are made with serial numbers. These numbers act as a way to identify the origins, methods of production and year of creation of any given piano. The model number will be associated with it and should be printed in the same locations.The trick is knowing where to look on the instrument. Massive databases exist online with nearly all serial numbers used from nearly every piano manufacturer. If you are looking for these numbers on your Wurlitzer upright piano, take a look inside. Open the lid and look down from the top. The numbers may be printed or placed on a sticker on the top right or left of the harp. Remove the upper facing cover from the piano and sit on the bench. Directly at eye level should either be the printed number, or a hole through the harp that may have the printing on the wood behind it. Look at the inner sides of the piano near where the upper-facing cover was mounted. A printed sticker may be on the interior of either the left or right side. Turn the piano around and look at the rear of the soundboard. If the serial and model numbers are printed nowhere else, they must be printed on the rear. 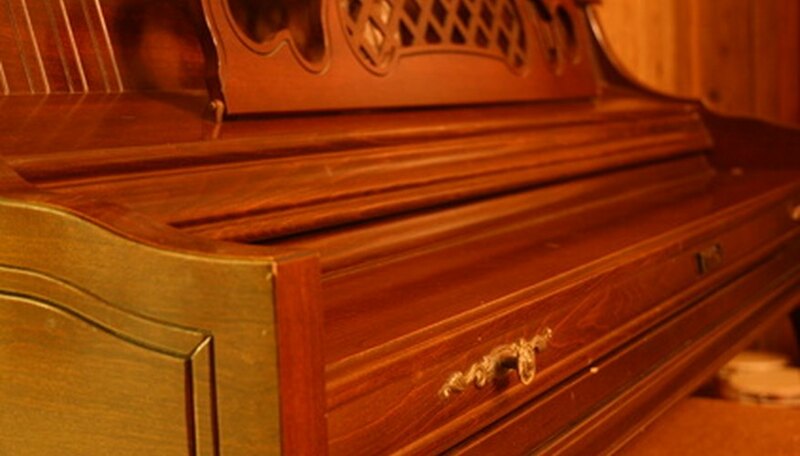 Be careful when removing piano parts as they may scratch or dent either themselves or other furniture. Be careful spinning the piano. If on carpet, it may not move and, if on hardwood, it may scratch the floor.